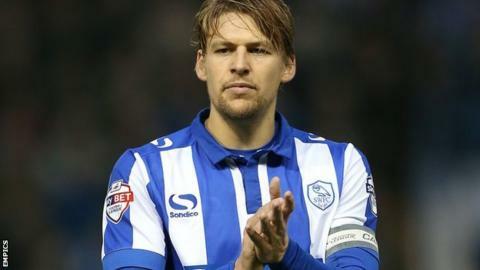 Sheffield Wednesday defender Glenn Loovens and midfielder Sam Hutchinson have signed two-and-a-half-year contract extensions. Loovens, 32, has been with Wednesday since November 2013 and has made 77 appearances in all competitions. He has previously had spells with Feyenoord, Cardiff and Celtic. Hutchinson, 26, joined the Owls on loan from Chelsea in January 2014 before making the deal permanent that summer and has played 21 times this season. The duo are the fourth and fifth players to extend their deal with the Championship play-off hopefuls this week after Jack Hunt, Barry Bannan and Atdhe Nuhiu. Loovens told BBC Radio Sheffield: "It's always easier to settle when you have a long-term contract. I feel good and I feel fit and I want to repay the faith shown in me. "I think promotion is a real possibility and it should be the main aim for us. "It's important to get some structure and stability in the club and all the players who have signed deals have deserved them."